The financial performance of HBO and Netflix could not be farther apart today - but as the two companies converge, how will their margins (and ambitions) change? Since the moment Netflix established its streaming video business, Hollywood has struggled to decide exactly what the company had become. A digital-era customer? An existential threat? Partner? Competitor? Disintermediator? MVPDs, too, have wrestled with the question. Was it a Pay TV substitute or compliment? Another channel to be aggregated and distributed – or a cord cutter’s dream? After six years of such questions, Netflix decided to take control of its external identity. “Our goal”, Chief Content Officer Ted Sarandos told GQ in early 2013, “is to become HBO faster than HBO can become us.” Regardless of the comparison’s fit, the pick was shrewd. HBO, after all, was one of the most valuable and profitable media assets in the business (✓investors), willing to pay top dollar for the best Hollywood content (✓media companies), had an industry-leading reputation for quality (✓viewers,✓talent), represented an additive, non-cannibalizing portion of a consumer’s video experience (✓MVPDs), and perhaps best of all, the network’s financial performance was not disclosed by Time Warner – thereby preventing Wall Street from performing a detailed comparison of the two companies (✓Netflix management). A year later, however, this last point changed. Time Warner – no doubt believing that the press and financial community had given its premium network short shrift – began separating the Home Box Office from the rest of its cable networks in its public filings. The results were shocking. Netflix’s OTT service may best the premium cable giant when it comes to revenue, media attention, consumer obsessiveness and minutes delivered, but HBO absolutely dominates the upstart when it comes to profit. The companies’ disparate performance stems from the fact that, for all their apparent similarities, they are rooted in fundamentally dissimilar business models. But these models are converging. As a result, identifying where and how these two differ tells us not just how they’re likely to change in the coming years – but also what they’ll need to do to if they want to sit on the industry’s Iron Throne. In 2014, Netflix’s streaming service hit a milestone that was impossible to ignore. Though it had only half as many subscribers as HBO, it managed to out-gross the veteran network by nearly 15%. At its current rate of growth, the company will widen this lead to more than 75% by December of this year. 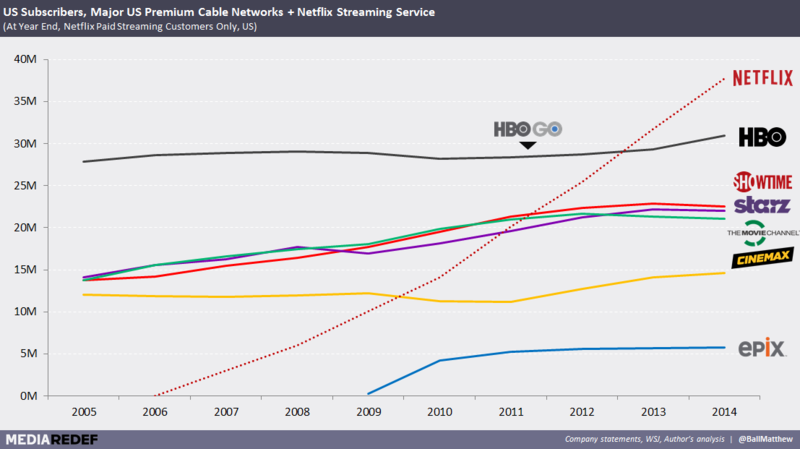 Despite this added scale, Netflix is unlikely to come anywhere close to rivaling HBO’s bottom line. In 2014, HBO achieved an adjusted operating income margin of approximately 32.3% (worth $1.3B) – almost 9.5x more than Netflix’s 3.5% ($164M). The best way to understand the performance gap between these two is to investigate their P&Ls. And there’s a lot to unpack. Content Sales: HBO generates roughly $500M per year by selling its original content to end-consumers via home video (DVD/Blu-Ray and/or digital download) and since the second quarter of 2014, an additional $150-200M by licensing select titles to Amazon Instant Video. This revenue stream isn’t costless – HBO must purchase a broader set of content rights or produce the content directly, and cover additional distribution-related expenses – but it adds significant upside to the company’s already profitable subscription business. Netflix, on the other hand, has typically purchased only the streaming rights to their original series and films – and with temporary exclusivity at that. As a result, many Netflix originals (such as House of Cards and Orange is the New Black) can now be found on Xfinity, Verizon FiOS and Amazon.com – but with the proceeds going to the likes of Sony or Lionsgate. In recent quarters, Netflix has been buying comprehensive rights to many of its original titles. However, the company prefers to use these expanded rights to direct interested viewers to its $9 monthly subscriptions (or to increase consumption among existing subscribers), rather than to sell $15 (wholesale) home video sets. 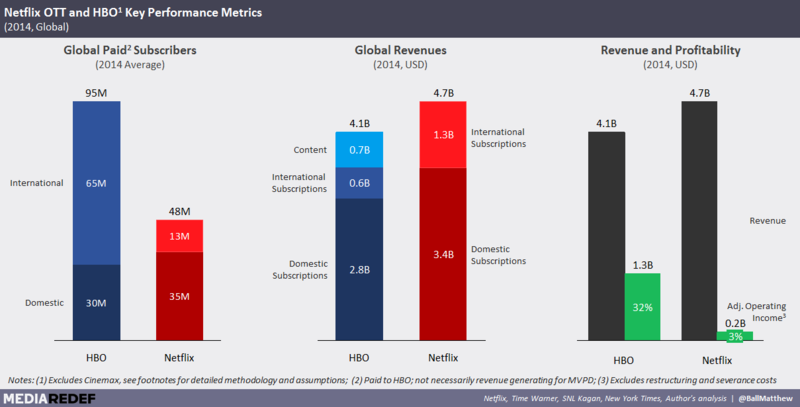 International Subscriptions: Though its content library can vary tremendously, Netflix’s service and business model is largely identical across its more than 50 markets worldwide. As a result, each country requires Netflix to buy a new set of content rights and stand-up local operations (e.g. customer service, marketing). HBO, on the other hand, deploys a range of different models worldwide, from owning and operating a foreign network (HBO Asia), to establishing joint ventures (HBO Netherlands), or merely licensing its brand and original content to another media company (Bell Media’s HBO Canada). What’s more, the majority of these networks aren’t even premium channels – they’re basic, broadcast or even OTT-only. As a result, HBO receives between $0.14 and $13.00 per international subscriber per month, many of whom cost the company virtually nothing to serve. Furthermore, the flexibility of HBO’s international models allows the company to avoid the pitfalls of individual market dynamics, scale, price points and currency fluctuations – all of which distort Netflix’s consolidated performance. In addition, the company can (and does) change its approach to individual markets as specific contracts and commitments expire. Cost of Revenues: Though HBO’s library is often considered to be the best in the business, the company spends dramatically less on content than Netflix in terms of both total dollar amount ($1.6B $2.7B) and as percentage of revenues (38% v. 56%). This differential has a lot to do with the role each network plays in the entertainment ecosystem. Netflix’s value proposition is partly rooted in the immense size of its catalogue. Though the average viewer will watch only a fraction of its library (and only select originals), the service needs to be able to satisfy any given user’s fifth on-demand hour, as well as their 500th (after all, their cord-cutter customers don’t have a Pay TV subscription to fall back on). HBO, meanwhile, only needs enough content to cover a linear TV schedule, focuses on providing the “best” content, has significant audience overlap across its original programming and represents only a portion of each subscriber’s overall Pay TV experience. To this end, Netflix typically offers some 5,000 films, while HBO GO has fewer than 350. Content Delivery & Distribution, Operating Costs: Comparing these two cost categories is challenging due to the companies’ unique corporate structures and financial disclosures (i.e. the definition of “materiality”). What matters is their sums: 30% of revenue for HBO and 40% for Netflix. This comes from three key differences. In exchange for retaining roughly half of HBOs ~$16 monthly end-consumer price, Pay TV providers such as Comcast and Cablevision handle all customer service and billing for HBO, as well as significant portion of advertising costs. Netflix, on the other hand, pays for all of these expenses. Furthermore, MVPDs often offer promotional trials or discounts (at their own cost) to attract target customers and will continually pitch the service during customer touch points (e.g. calling in to make account changes). As a linear, B2B focused network, HBO also incurs substantially lower technology development and content distribution (e.g. CDN) costs than Netflix. While HBO and Netflix provide the same core product (video entertainment) and are becoming more alike each day, their business models are fundamentally dissimilar. For HBO, content sales and international revenue are primarily added upside to a highly profitable, domestic B2B premium cable business. Netflix not only pursues its full, primarily B2C business model in each of its 50+ markets worldwide, but it also tries to control the end-to-end experience (and increasingly the content, too). 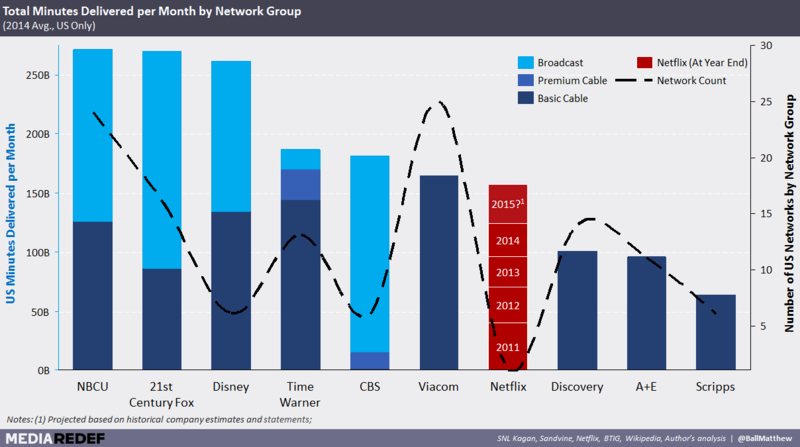 As such, it’s prudent to analyze the two “networks” on a per subscriber basis, with particular attention to Netflix’s domestic and international segments. As expected, HBO is significantly more profitable – banking roughly $3.37 (or 13x) more per subscriber per month ($3.65 v $0.28). Yet, much of Netflix’s shortfall is driven by the company’s international markets, each of which is in a different stage of development, penetration and maturation. Today, Netflix loses approximately $2.10 per month across its 13M+ paid international subscribers. Domestically, however, the company is far more competitive. It still lags HBO, but “only” by a factor of three. HBO certainly has the better business model for today, but if Netflix can scale its domestic subscriber base, push up prices, or control its costs, the company may yet take the industry’s Iron Throne. When Reed Hastings told investors in 2012 that he believed Netflix could grow to 60-90 million domestic subscribers, many of the company’s most vocal supporters were taken aback. The United States, after all, has only 120M households, 100M of which have Pay TV subscriptions. What’s more, the industry had long considered 30M to be a ceiling for premium video channels. Even as HBO scaled its brand, originals and trophy count, and launched its award-winning TV Everywhere service HBO Go, the network was unable to surpass this high watermark. Yet, only a year and a half after Hasting’s declaration, Netflix blew through it. And over the following year, it added another 8M more. Netflix is able to achieve such scale because in the minds of consumers, it isn’t any one network. It is the Disney Channel. And AMC. And Syfy. And National Geographic. The inherent limitations of linear television means that networks such as CBS, TNT and Cinemax, can only focus on a few demographics and genres. Netflix, on the other hand, can be all things to all people. As a result, the “network” can attract and sustain audiences that cable networks simply cannot – no matter how well they’re promoted or bundled. And it shows: Netflix’s usage is so significant that it’s beginning to rival the entire portfolio of the major television groups. Netflix, it turns out, looks more like Time Warner’s television business than just HBO. With this in mind, any preconception of how many subscribers Netflix can or cannot achieve should fall by the wayside. 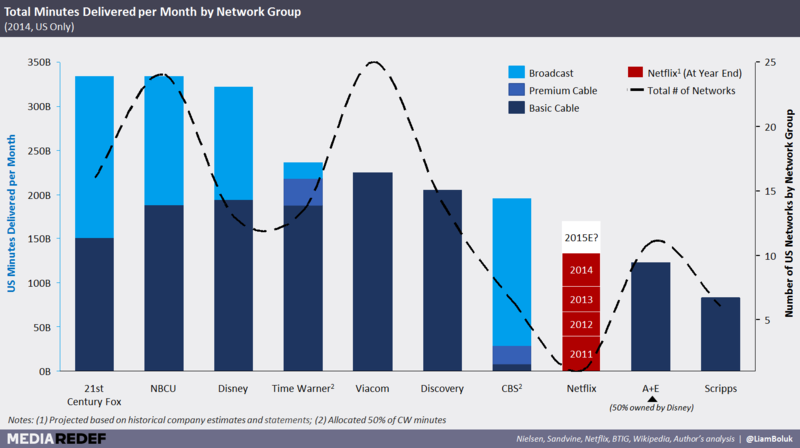 Furthermore, this consumption speaks to Netflix’s next opportunity: pricing. 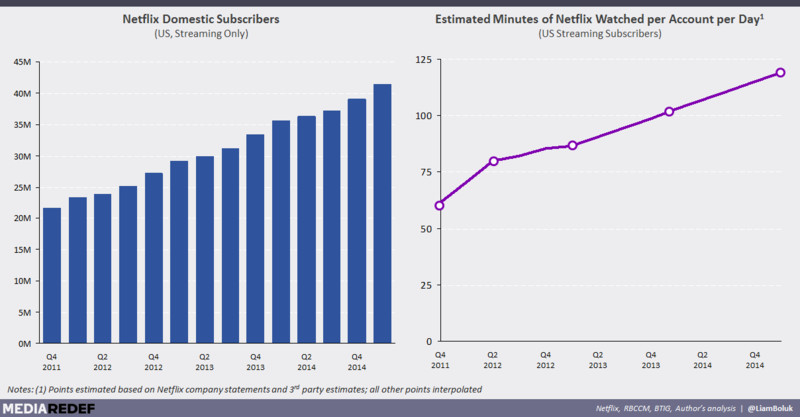 One of Netflix’s most impressive (if underappreciated) accomplishments is that it has dramatically increased average per account consumption even as it has grown its subscriber base from early adopters to mainstream audiences. 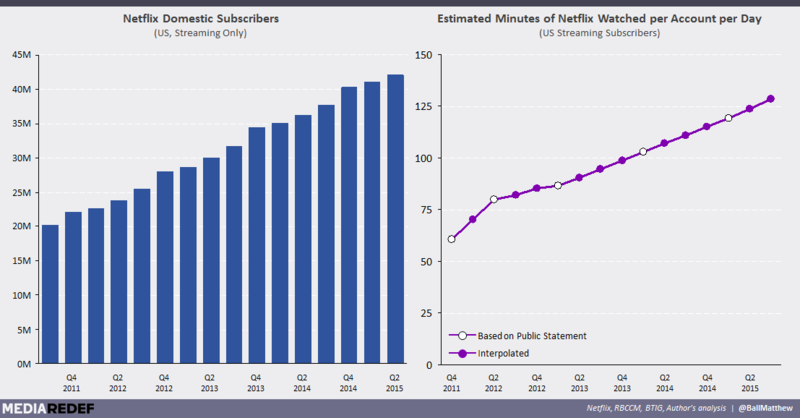 During the fourth quarter of 2011, the average US Netflix account used the service for roughly 60 minutes per day. Today, usage is just short of two hours. In theory, this increased consumption should enable the company to increase its monthly price. The average American household consumes roughly eight hours of TV per day (six hours after commercials) at a cost of $70 per month; receiving two (commercial free) hours on Netflix for $8.99 seems like a steal. HBO, meanwhile, costs nearly twice as much despite being watched roughly 50% less. Unsurprisingly, pricing is a huge profit lever. 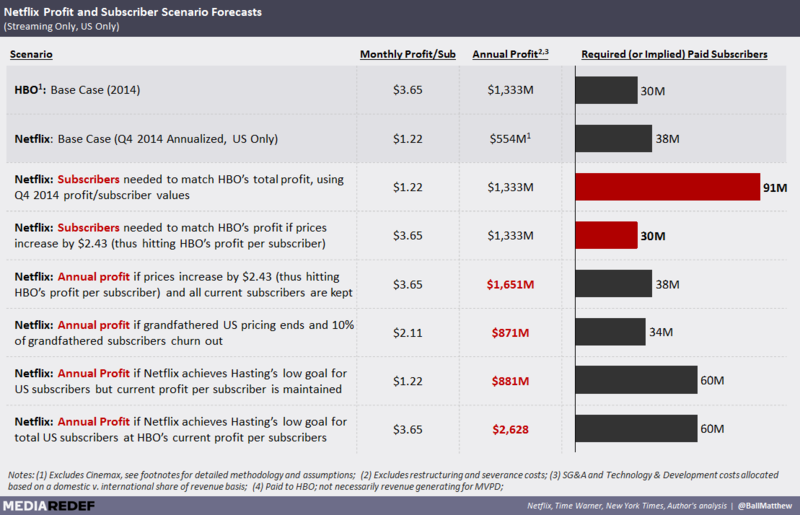 If Netflix managed to increase its average monthly fee from $8.14 (as of Q4 2014) to $10.50 (thereby generating HBO-levels of per subscriber profit) without losing any subscribers, the company would actually exceed HBO’s annual profit by nearly 25%. 100% subscriber retention is unlikely, but even if one in every five were lost, Netflix’s profit would still match HBO’s. Furthermore, Netflix could achieve much of this increase by ending its grandfathered $7.99 pricing (the company’s core $7.99 plan increased to $8.99 for new customers in May 2014). Even still, Netflix may not need to raise the cost of its core plan. If daily consumption continues to grow, many subscribers may find themselves needing to purchase higher-priced plans that allow more simultaneous streams. In addition, those looking to watch Netflix’s 4K content already need to fork over $11.99 a month. 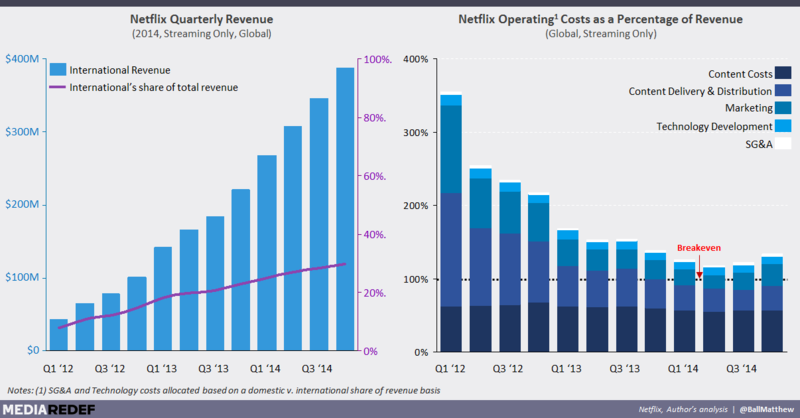 Though Netflix’s net income margins remain modest by industry standards, the company has made considerable gains over the past three years: direct and allocated streaming costs have fallen from 103% of revenue to only 85% today. Clearly, efforts to scale into profitability are succeeding. That said, the recent rise in per subscribers marketing spend suggests that Netflix is starting to struggle to grow domestic subscribers. After all, the company already has 23% more paid subscribers than HBO (38M v. 30M) and is targeting 22 to 52M more. The classic bear argument against Netflix’s scaling efforts claims that content licensing costs will continue to rise as competitors bid up prices and rights-holders set their eyes on Netflix’s publicly-filed profitability. 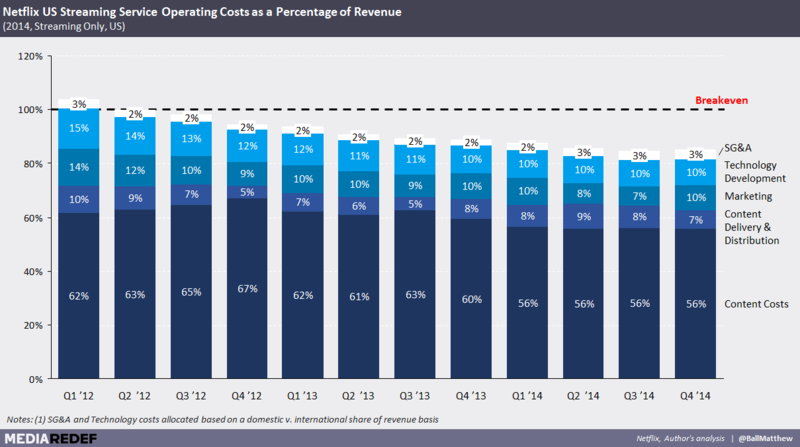 Yet, Netflix has progressively managed down even these costs – from $4.93 per subscriber per month in Q1 2012 to $4.54 in Q4 2014 – despite the fact content consumption has surged This suggests that: (1) the average consumer is viewing an increasing amount of Netflix originals (which likely offer a superior cost-to-minutes-watched ratio than the service’s licensed titles); and/or (2) Netflix’s consumption data has enabled the company to be smarter about which titles they do and do not purchase, as well as the “right” price for these licenses; and/or (3) the company’s growing buyer power (and ability to purchase global rights) has enabled it to force down per-title/library costs. It’s tough to test these three hypotheses given the company’s limited disclosures, but overall, it’s likely a strong mix of the three. As the company grows its global subscriber base, it’s also likely see improvements in its domestic profit margins. Each new international customer will result in a broader allocation of corporate costs (e.g. SG&A and Technology & Development), for example. Most crucially, added scale will help Netflix manage (or even decrease) its content costs – either by adding to its already significant buyer power or through the purchasing global rights (both of which may start to challenge HBO’s ability to buy Grade A content at economical prices). HBO is one of the media industry’s most valuable and impressive assets – high-priced, but widely consumed; a home for auteurs, as well as bean counters; critically lauded, but without pretension. More importantly, the 43 year old giant is still nimble. HBO Go is a deliberate attack on the company’s own high margin content sales; management continues to acquire many of its previously at-arms-length foreign networks (such as HBO Brazil in 2010 and HBO Asia in 2013); the company has already launched a direct-to-consumer OTT network (HBO Nordic) and will be launching a domestic OTT service later this year. All of these efforts will challenge the HBO’s historically hands-off business model, existing cost structure and longstanding programming strategy. At the same time, Netflix is building an empire that is quickly dismantling industry convention, from breaking through the 30M domestic subscriber ceiling, to programming for every genre and achieving levels of usage that’s starting to rival television as a whole. Even still, the OTT upstart is unlikely to threaten the veteran network; for media lovers, the question will rarely be HBO or Netflix. Instead, Netflix’s success speaks to the opportunity as yet left untapped. HBO’s current business model allows the company to not only shield itself from customer service and billing expenses, but also secures dozens of partners that will aggressively market and promote its product. In exchange, however, HBO gives up $8.00 per subscriber per month (or $2.9B a year) to Pay TV providers such as Comcast and Time Warner Cable. In the traditional, linear TV world, this tradeoff made sense – and the only real alternative was basic cable distribution. But today, this model – restrictions, benefits and all – can be cast aside. And the economics are a lot closer than one might think. Though Netflix prides itself on the breadth of its catalogue and the diverse interests of its subscriber base, it’s hard to overstate the importance of its library of children’s content. “While Netflix will get more attention from adult series such as House of Cards and Arrested Development”, Chief Content Officer Ted Sarandos told USA Today last year, “the kids arena is incredibly strategic to us.” In fact, this “genre” is so strategic that it receives not only its own dedicated section and interface, but an exemption from the company’s much marketed all-at-once release model. What’s more, the company’s single largest original content investment was not House of Cards or even Marco Polo – but for 300 hours of brand-new cartoons from DreamWorks Animation. In a linear environment, bundling children’s content into an otherwise adult-focused network would seem absurd – just imagine HBO or Showtime replacing their Sunday afternoons with Puss in Boots or Dora the Explorer. But in an on-demand environment, this bundle has immense value. At only $9 a month, few parents would consider nixing their kids’ favorite “network” (especially one without commercials) – let alone one that they also love and use. Better still, the service acts as the perfect go-anywhere, on-demand babysitter. One of the most challenging questions facing Home Box Office today is what role Cinemax, HBO’s jointly-managed sister network, will play in the company’s over-the-top future. In a linear world, the decision to operate to two premium channels was as straightforward as it was profitable. Through HBO and Cinemax, Home Box Office was able to serve multiple demographics during the same time slot, extract additional revenue from the TV-obsessed and drive bundle-based stickiness that would help defend its territory from Showtime Networks and Starz Inc. In a digital environment, however, this strategy plays out differently. Here, Home Box Office’s multi-network model represents a deliberate choice to stand-up a second, technologically unnecessary service rather than make its HBO offering richer and deeper. Case in point: Cinemax’s MAX GO, which looks and feels just like HBO GO. The TV Everywhere service has a content library that would undoubtedly delight (and likely attract more) HBO customers, including titles such as Gravity, Godzilla, Her, The Last King of Scotland, and Casino Royale. Yet it remains entirely walled off. Indeed, the service’s existence is already and likely to remain vicarious. “HBO will always be the big brother,” Cinemax’s Head of Original Content, Kary Antholis (who also serves as Head of HBO’s miniseries) told Quartz last year, “our goal is to build Cinemax to the point where it’s the preferred second tier in premium television.” Furthermore, it’s not clear that that an OTT/D2C Cinemax product could stand on its own. Instead, the network relies on a tee-up from its elder sibling. “[Michael Lombardo, President of Programming at Home Box Office] has made a commitment to using HBO to help give a boost to the Cinemax brand,” Antholis explained to Quartz. To that end, HBO re-broadcast the pilot of Cinemax’s newest (and most-HBO) original series, The Knick, on HBO the day after it aired and made it available to HBO GO users. This, of course, just creates financial and experiential friction for the user. Friction that doesn’t need to exist. Could Netflix split itself into a variety of genre-based services or create genre-specific add-ons? Absolutely, but the company prefers to make its core product the best it can be – and one that can serve almost every member of every household in the country. This isn’t to say Cinemax needs to be folded into HBO – the move would further antagonize MVDPs and have a significant impact on short-term profits – but it begs the question of how “all in” Home Box Office is to OTT. Netflix may have an eight year lead on HBO, but the company has the best brand in the business when it comes to high quality content. If any network can put out a true multi-genre competitor, it’s HBO. Though dropping MVPD-distribution would upend the Home Box Office’s highly profitable business model, a direct-to-consumer OTT play could net the network billons in incremental profit per year. Yet, the ramifications would go far beyond HBO. Time Warner received more than $5B in affiliate fees from MVPDs in 2014, few of whom would take kindly to the loss of $2.9B in annual HBO commissions (and potentially another $0.9B for Cinemax). In addition, the move would only accelerate the decline of the Pay TV business – a business that contributed some $3B in to Time Warner’s bottom line last year excluding HBO. What’s more, going OTT is about far more than domestic subscriptions and content sales. Pursuing the online opportunity means committing to scale. HBO will need to bring its domestic, online model overseas, which means further investment in foreign markets and ending lucrative, cost-free licensing agreements. There’s no reason, for example, that the company should continue to fully license its brand and content to Canada’s Bell Media once an OTT service launches in the US. In addition, HBO will need to invest in new programming talent and licenses – both to improve the depth of its library, as well as its breadth (i.e. kids content) – and reconsider the role of Cinemax. HBO may be the undeniable king of premium cable today, but much like the Lannisters, it rules a throne that’s eagerly contested and will be fought for both at home and abroad for years to come. Matthew Ball is a Director of Strategy & Business Development at Otter Media and leads Strategy & Originals at REDEF. All views are his own. He can be reached at matthew@redefgroup.com, followed on REDEF or on Twitter. Time Warner consolidates the performance of HBO and Cinemax when reporting the “Home Box Office” segment. As such, key assumptions have been made to separate the two; (A) Domestic Subscription Revenue has been estimated based on an average blended (i.e. HBO & Cinemax) monthly affiliate fee of $7.24, per SNL Kagan. The remaining subscription revenue was classified as International; (B) Domestic Subscription Revenue was then split based on an average monthly affiliate fee of $8.00 for HBO, per New York Times, thereby assigning 75% of these revenues to the network and 25% to Cinemax; (3) HBO was assigned 75% of Content Revenue plus a 5% premium based on its comparatively more expensive and in-demand original programming; (4) HBO has also been assigned 75% of all Content, Other Direct Operating Costs, SG&A and Depreciation & Amortization expenses plus a 5% premium based on the assumption that the network receives a disproportionate amount of corporate attention. Unless otherwise specified, the rest of this piece will refer only to Netflix’s streaming business. Though both the company and media are prone to conflating the two when discussing financial results, this is unhelpful when it comes to actually evaluating the company’s progress and future. Netflix is increasingly interested in buying global content rights, thereby eliminate some of the additional per-market content costs. However, this also means that many content rights are either unused or underused.